refers to a self-medicating placebo- and pharmacy-based combination therapy commonly used by the rural folk in the Quezon area. The most popular of the self-prescribed prescription-pharmaceuticals, it originally paired the antibiotic Chloramphenicol with the analgesic/antipyretic paracetamol. Dispensed by the botica (drug store) - even by some sari-sari stores - upon request without a prescription, it is usually taken as a single dose for a variety of illnesses and complaints: flu-like syndromes, colds and febrile gastrointestinal diarrheal disorders. The antibiotic part of the combination has been substituted with amoxicillin. 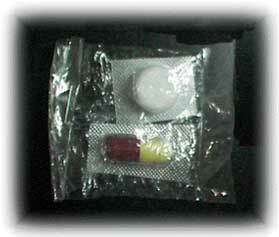 A second or third dosing is determined by the user, depending on severity or persistence of symptoms.